Stress can come in many different forms, but it will affect everyone in some form at some point in their lives. While most instances of stress are normal and part of everyday life, large amounts of stress can have consequences for both the body and mind, some of which can even be deadly if not managed accordingly. If you are dealing with high amounts of stress, you may be in search of a method of management to combat these negative feelings and any associated anxiety. In order to find a way of managing stress and anxiety, it’s important to first determine the cause of your stress and the ways in which it is altering your life. By pinpointing what triggers your stress and anxiety, you can begin a path to an effective course of action that may greatly improve your quality of life. Stress can be described as a physical response in which the body releases a complex combination of chemicals and hormones as a defense against what it interprets to be an attack. During this “fight or flight” mode, chemicals such as adrenaline, norepinephrine and cortisol are released to prepare the body to take physical action. This sets off a chain of reactions, including diverting blood to certain muscles or shutting down certain bodily functions, like digestion. The release of chemicals like adrenaline and cortisol can give you a rush of energy. You may feel your heart pounding faster than usual, or you may begin breathing faster. These physical responses allow us to zone in our focus, which can help us in dangerous situations. This is why stress isn’t always considered a negative response. Stress becomes problematic when it arises in inappropriate situations. Brain function is minimized when blood flow is directed toward other muscles. This can affect your ability to think straight, which may negatively affect your work or home life or both. Long periods of stress can have a negative impact on our health. For example, elevated cortisol levels can cause an increase in blood pressure or sugar levels. Acute stress is the most common among forms of stress. It can be caused by the demands and pressures of the past or future. While it can be thrilling in small doses, too much acute stress is exhausting and can lead to psychological distress in the form of headaches, an upset stomach or other physical symptoms. As the symptoms are easily recognized by most people, it does not carry the same risks as long-term stress. Whether your stress stems from the workplace or from your relationships, episodic acute stress may require a combination of treatments. There is a very real reason for the phrase “stress kills.” Chronic stress can wreak havoc on your life. While acute stress can be attributed to work or other causes, chronic stress is usually associated with larger issues, such as poverty, a dysfunctional family, or being unhappy in a marriage or career. If you are experiencing chronic stress, you might feel helpless, as if there is no end in sight to the situation making you miserable. You might even become accustomed to these feelings. The results of this can be deadly. Chronic stress can cause suicide, heart attack, violence, stroke and, in some instances, even cancer. Are Stress and Anxiety Related? While the terms “stress” and “anxiety” are often linked, they are not the same. Not everyone who experiences stress experiences anxiety, although anxiety can be one of the many symptoms associated with stress. These anxious feelings may exacerbate your worries, driving your stress to new levels. Managing stress and anxiety is important as high levels of these negative feelings can lead to other mental health issues down the road. Therapy can also be highly effective in managing your stress and anxiety. It can help you determine the underlying causes of your stress and anxiety, teaching you how to relax and view situations in new, less threatening ways. While therapy can be extremely effective in managing your stress and anxiety, it’s important to seek methods tailored to your specific needs. According to the American Psychological Association, people who attend therapy may show significant improvement within just 8 to 10 therapy sessions. Cognitive behavioral therapy is frequently used to manage anxiety, as is group behavior therapy. There are also a number of natural remedies that can help in relieving anxiety. 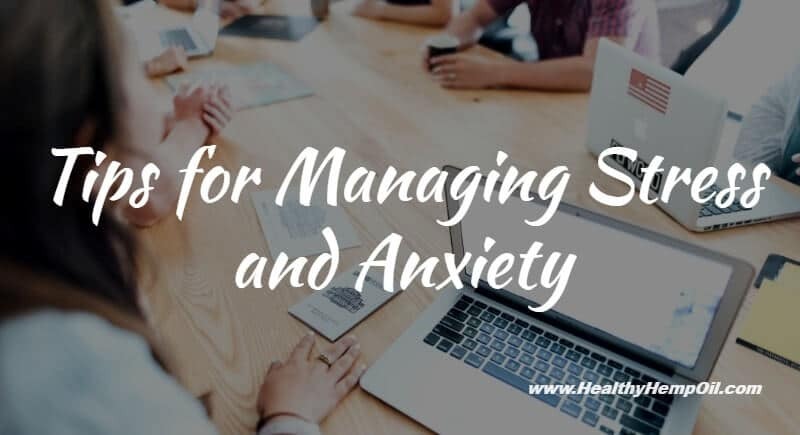 It’s important to explore a variety of options to determine your best shot at managing and alleviating the symptoms of your stress and anxiety. Do you suffer from stress and anxiety? Which methods do you use to cope? Tell us in the comments below.